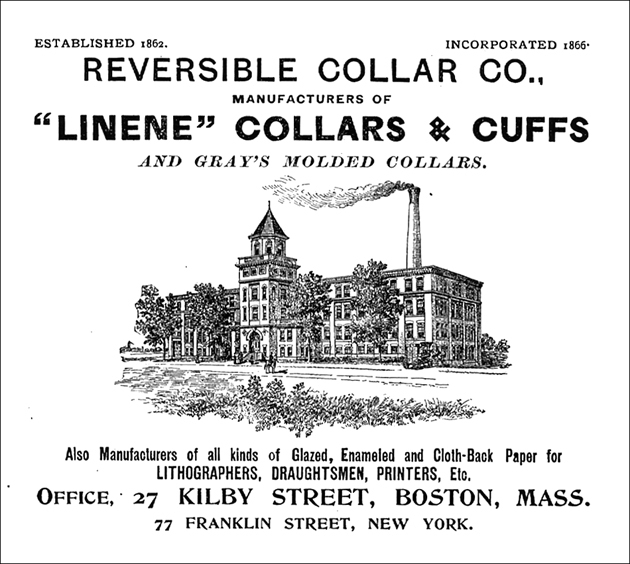 The origins of The Reversible Collar Company can be traced to the year 1862, when George K. Snow developed an improved manufacturing process for paper collars. Spurred by this invention, Snow entered into a collaboration with March Brothers and Pierce & Company and established a business in Boston to produce and distribute these collars. While the production of paper collars using this new method was short lived due to a collapse in demand, Snow was able to quickly transfer his inventiveness to the manufacture of a different type of collar. Indeed, in 1866, Snow patented a machine that combined cloth and paper into continuous rolls. This process not only replaced the previous manual method of combining these two materials, but also enabled the company to produce the ideal fabric for the production of machine-made collars. Based on this new manufacturing process, Snow established the firm of The Reversible Collar Company and moved the production facilities from Boston to Arrow Street in Cambridge (Stone, 1930; Gilman, 1896).